Well, I suppose it was inevitable. It was fun and I was dirty. The downside of a woofing good weekend. But, puppers, you have NO IDEA how much I don't like the tub. And, if you will look carefully, you will notice that this time my dad did not even put bubbles in the tub before he launched lovingly placed me into that caldron of scary water the tub. Must there be a downside to fun, puppers???? I totallu am with ya on this!! I HATE baths and I know one is coming tomorrow!! YIKES, hide...i gotta hide!! OOoooooo! Bet you smell pretty good right about now, though. Yeah? Oh, yeah, I smelled great for about a day. Now mom says I am back to being my stinky (but adorable!) self. Yup, there is a down side to playing in the dirt as Stanley and I recently discovered. 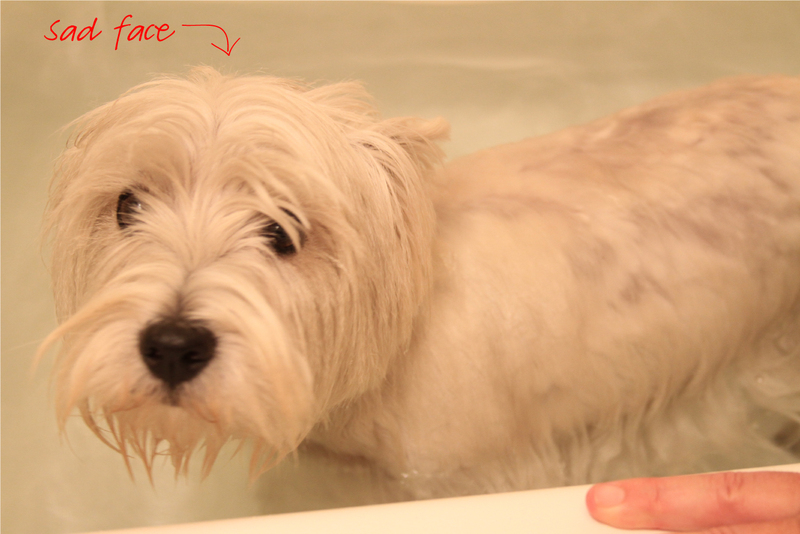 You sure look supersad standing in that bathtub, Duncan! I can see you were not happy there! Just be glad you're not itchy like me and under vet's orders to get water-boarded EVERY day!! EVERY day????? Yikes!!! My thoughts are with you buddy!!! A real balancing act around here! While Mom is away, Me and Dad will play!! !